TOP ECHELON (AUS) (Grey 1999-Stud 2003). 2 wins at 2, 2d QTC TJ Smith Classic, Gr.1. Sire of 138 rnrs, 79 wnrs, inc. SW River Lad (BRC Stradbroke H., Gr.1), Our Boy Malachi, Lady Echelon, SP Nickiera, Topping and of Alpine Dancer, Ardoyne Road, Miss Miao, Top Rada, Leveraction, Our Echo, Rosie Posie, Zou der Zee, Captain Tango, Zouzoukakia, Elite Echelon, Ellawisdom, Not Too Sure, Little White Horse, Toptwo, Cossie, Kopella, Jonzali, Hot Ice, etc. IRUKANDJI (Dundeel). Winner at 2, A$151,425, in 2017-18, ATC Schweppervescence H., Gr.3, 2d VRC Football S., L, 3d ATC Gloaming S., Gr.3, 4th ATC Stan Fox S., Gr.2, Up & Coming H., Gr.3. Deanna Jean. 3 wins at 1100m, 1250m, A$88,200, SAJC James Boag's Premium H., Projection Graphics P., 2d SAJC Drink Driving? Grow Up H., Farmers Union Iced Coffee H., J Arkwright Edwards 90th H., Oakbank RC Coca-Cola H., 3d SAJC Hughes Chauffeured Limousines H., Mac Drink Driving Grow Up H., Evright P., 4th SAJC Morphettville Guineas, L.
Wanted Trio. Winner at 1400m in 2017-18 in Aust. Nicconi Leggera (f. by Nicconi). 3 wins-1 at 2-to 1050m, A$237,600, BRC Duporth Tavern 3YO H., Cascade 2YO H., 2d BRC John Carroll Electrical H., SQS Haulage 2YO H., 3d BRC Epoca Constructions H., Ipswich TC Ray White Ipswich H., SCTC Sky Thoroughbred Central H.
Our Echo (g. by Top Echelon). 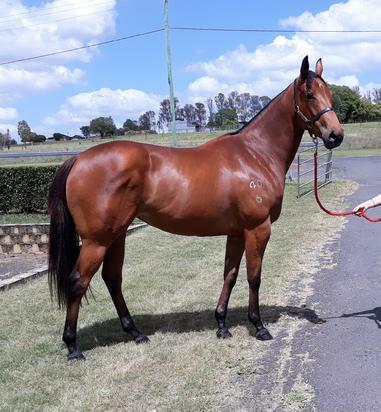 Winner at 1400m in 2018-19, GCTC Boom Boom Room H.
Success Baby (g. by Magic Albert). 2 wins at 1400m in Malaysia. Court Achiever (g. by Court Command). Winner at 1200m in Macau. Mr Fire Shoes (g. by Get Square). Winner at 1000m in Aust. Idesa Bay. 3 wins. See above. DANZERO (Danehill). Second on The 1993-94 Australasian 2YO Classification. 4 wins-3 at 2-to 1200m, A$1,350,900, STC Golden Slipper S., Gr.1, VATC Blue Diamond Prelude, Gr.3, VRC Maribyrnong Trial S., L, VATC HDF McNeil S., L, 2d AJC Sires' Produce S., Gr.1, 3d STC Todman Slipper Trial S., Gr.2, MVRC CS Hayes S., Gr.3. Successful sire. Megatop (Prego). 6 wins-1 at 2-to 1400m, A$129,080, WATC Easingwold H., Belmont Community H., BMW 7 Series H., New Year Welter H., Hudson H., 6PR-Easter P., 2d WATC Sires' Produce S., Gr.2, Challenge S., L, 3d WATC Belmont Park Cup, L, 4th WATC Fairetha S., L, Belmont Guineas, L, Ascot Gold Cup, L.
PERMISSIVE (Snippets). 3 wins-2 at 2-at 1000m, 1200m, A$120,700, Illawarra 2YO Classic, L, AJC Smith & Nephew Birmingham 2YO H., STC APN Outdoor H., 3d NSW Tatt's RC Furious S., Gr.2, 4th AJC Keith Mackay H., L, Canonbury S., L. Producer. GOLD SALUTE (Testa Rossa). 8 wins from 1100m to 1600m, A$576,748, VRC CRV Winter Championship H., L, CRV Winter Championship Heat H., Murray Cox H., MRC Zambari H., MVRC Direct Alarm Supplies H., MRC Future H., 2d MRC Toorak H., Gr.1, VRC Bobbie Lewis H., Gr.3, Sale Cup, 3d VRC Emirates S., Gr.1, MVRC CBUS H., 4th Seymour Cup, L.